Do you have a party, Spring get-together, or wedding coming up? Well we’ve mentioned before that candy can make a perfect addition to any event. You can do so much with just a couple boxes of candy. Fill different shaped vases with mixed colors or all one color. Create a candy bar with to-go goody bags. Glue some to a cone or a sphere for sweet centerpieces. Or give them as thank you gifts. The possibilities are close to endless. Is pastel your event’s pallet? Well we have made a shopping list of all the pastel candies you’ll need. All you need to bring is the party! 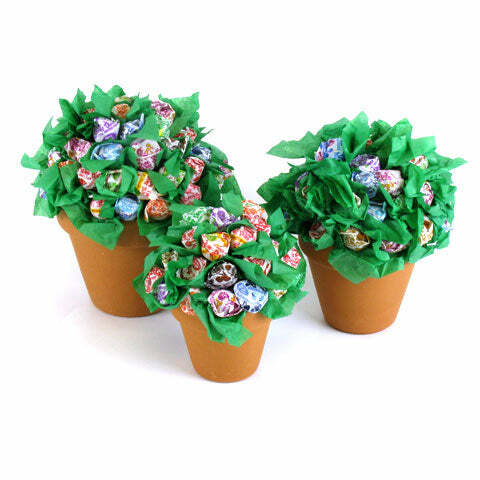 We used Dum Dums and terra cotta flower pots to make this fun bouquet! It’s simple. Easy! And these flowers never need water! Put a small piece of floral foam in the pot. Stick Dum Dums in like a bouquet of flowers. Add a little greenery with some green tissue paper. Have an idea for a pastel party? Post your ideas below.